Is your business, technology firm, medical or educational facility looking to remove computer equipment and electronics? Stevens Moving & Storage of Toledo has just the solution for you. 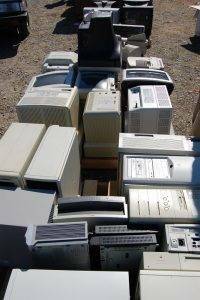 We specialize in electronics equipment packing and shipping services to help in the process of taking reusable electronics equipment from a business and prepare it for long-haul shipment to be put to use elsewhere. Our team of highly-trained packers and movers know what it takes to properly package, palletize and ship sensitive computer electronics so that they arrive to their new owners undamaged and ready to use. When it comes to packaging electronics for shipping, we have all the necessary tools and resources to handle the entire process efficiently and with the utmost care. Before you welcome in new electronics equipment to your place of business, you must first take care of removing the old electronics from the premises. Through our decades of experience, we have perfected our techniques in moving electronics. Whether you need to pack and ship numerous monitors, copier machines or massive computers, our electronic shipping services cover it all. Once you’ve sold your reusable electronics equipment, leave the rest up to us. We will start by arriving at your business with the proper boxes, wrapping and packing material and pallets. Our packers will thoroughly package and palletize your electronics to ensure protection during its transport. Once they are loaded onto our moving trucks, we will store your electronics in our secure warehouse. From there we will ensure all items are inventoried, weighed and prepared for long-haul shipment. From start to finish, you can trust Stevens Moving & Storage of Toledo to handle your electronics equipment packing, palletizing and shipping on time with minimal downtime and disruption to your business. If you have recently sold you reusable computer equipment and other electronics, hire a mover to take care of the heavy lifting for you. Our expert staff specialize in packaging electronics for shipping and we’ve helped several businesses get their electronics equipment safely to their new owners over the last 45 years. Packing, palletizing and shipping electronics internationally can be a quick and smooth process when you choose Stevens Moving & Storage of Toledo. Contact us today or fill out our form for a free quote.